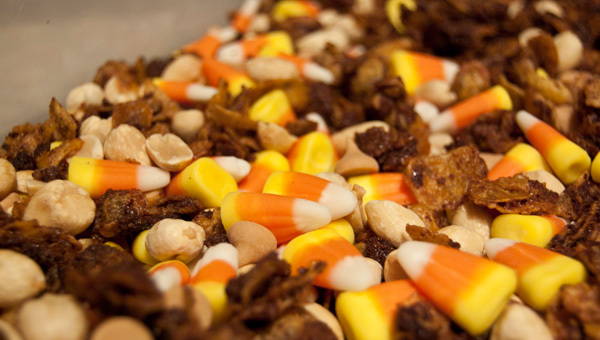 If you're ever looking for a snack mix to bring to a fall party, make this. Please. It's so good. But don't invite me or I'll be tempted to eat it all. I can't resist its salty sweet crunchy melt in your mouth goodness. Which results in an addicting, but filling, snack mix. One caveat: if you make a pizza before you make the cornflake crunch, your oven might be lying to you when it says 275 degrees. It's probably still 350 and your cornflake crunchies are burning. But you'll still want to eat them. Not that I would know...ahem. 1. Preheat oven to 275 degrees. Line baking sheet with parchment paper or aluminum foil. 2. Mix together instant non-fat milk powder, light brown sugar, and salt. Add cornflakes and stir in melted butter until combined. Crushing flakes a bit as you go is fine. Evenly distribute flake mixture over prepared pan. Bake for 18-20 minutes. 3. 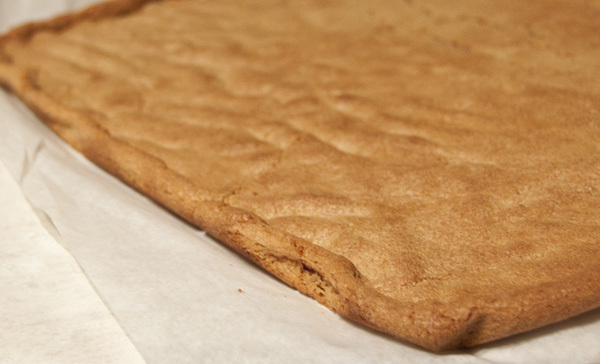 While that's baking, line another baking sheet with parchment paper and prepare cookie dough. 4. Whisk together flour, baking powder, baking soda, and salt into a small bowl. Set aside. 5. Cream butter and both types of sugar in a bowl with a hand-held or stand mixer on medium speed until fluffy. Add egg and vanilla, reduce speed to low and beat just until combined. 6. Alternate adding dry ingredients and peanut butter. 7. Heat oven to 375 degrees, and bake cookie for 13-15 minutes. 8. While that's baking, crumble your cornflake crunch into a large container. Add candy corn, peanuts, and peanut butter chips. 9. Allow cookie to cool, then break into bite size pieces and add to the candy + peanut mixture.